Back in the day, I'm sure many of us remembered playing Micro Machines. This classic title took a spin on the usual racing game conventions, having us use mini remote-controlled vehicles to dash across pool tables, beaches, gardens and plenty of other memorable environments. The arcade and not-so-serious nature of the game made it an instant classic and it entertained many gamers for many years. 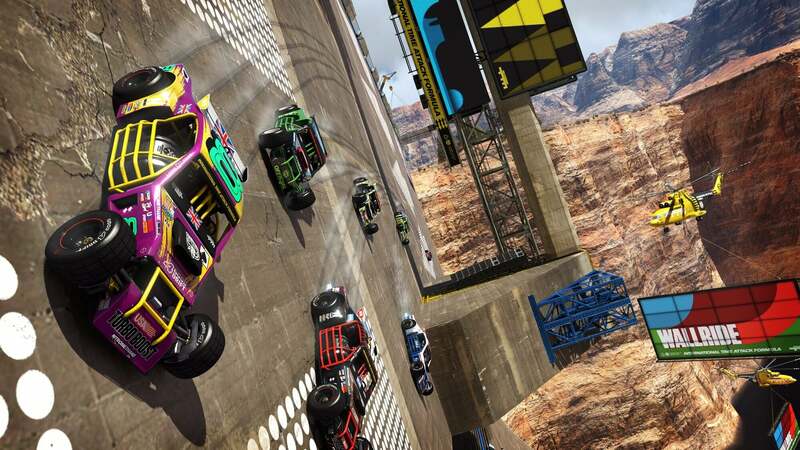 Recently, a racing title was released in both digital and retail form that could be said to be reminiscent of the years old racer. 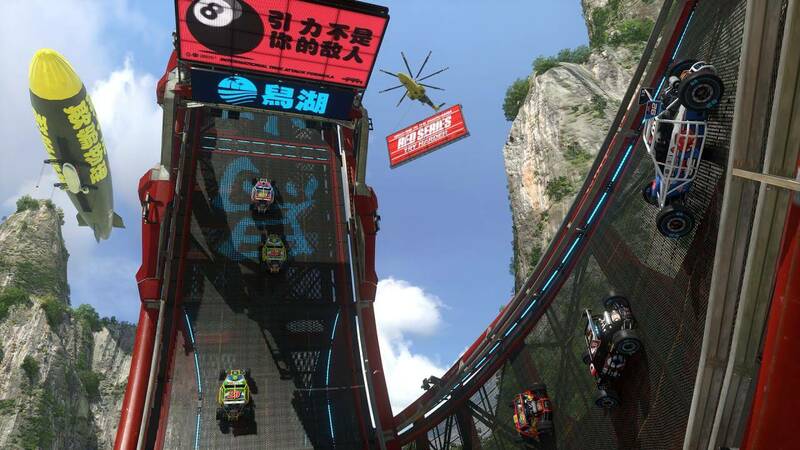 Trackmania Turbo has you racing through a multitude of different tracks and promises a unique arcade style. Is it a title worthy of your cash, though, or should you steer clear? Trackmania Turbo is an arcade style racer where you'll be going through four different environments hosting multiple tracks. The canyon, woodland valley, roller-coaster park and stadium await you and each have their own unique design. The canyon takes on a desert approach, the valley takes you through grassy and rocky environments, the stadium is a large futuristic area, but it's the roller-coaster park that holds the most charm as you might expect. Here, you race along winding coaster tracks while doing your best not to fall off or get thrown off. The four environments are all different in style, and so there is a fair bit of variety to be found. The game gives you access to a total of two hundred pre-made tracks, all varying in difficulty. It's not a simple goal of just making it to the finish line, though. 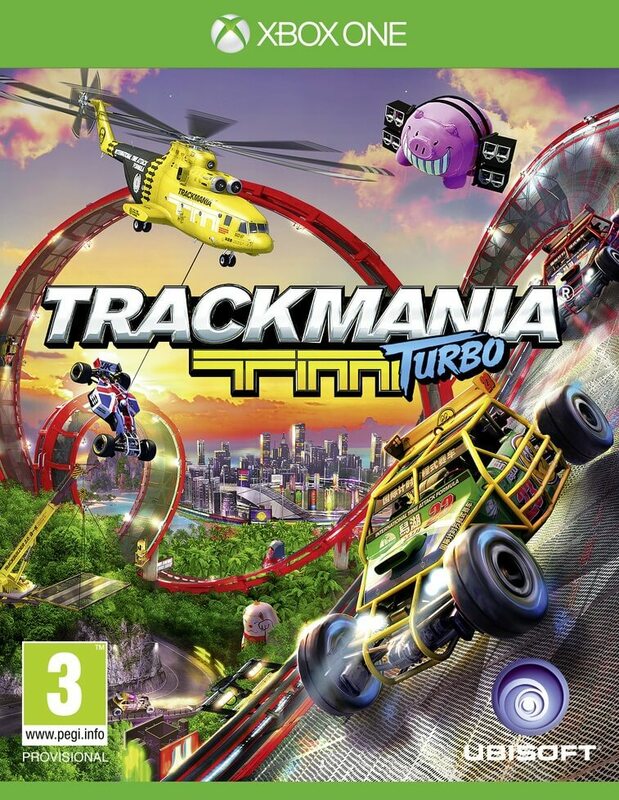 Trackmania presents with you with obstacles around every corner, attempting to throw you off course every chance it gets. There will be bends where drifting will be required, wall-climbing portions where you'll be desperately trying to cling on and not slide off, gigantic jumps where speed is extremely important to make it to the other side and even upside-down loops that might have you falling off completely if you go too slowly. These upside-down segments, especially on the roller-coaster tracks, are sometimes executed in an odd way, as the game forces you into an awkward first-person mode until you make it back to flat, solid ground. The cars struggle to hold it together when forced into positions like this, and crashing into the sides is all too common. Checkpoints are scattered throughout each track, and a simple press of the Y button will take you back to the last checkpoint if you mess up, but this ends up happening far too much. Frustration is imminent on nearly every track the first time through, and it feels like obstacles can be there purely to screw you up instead of providing an exciting challenge to overcome. To have full access to all the game's tracks you will need to unlock them in campaign mode. This takes the form of time trials for all 200 tracks, where you'll strive to attain a bronze, silver, gold or the illusive trackmaster medal. Each tier will task you with finishing progressively harder tracks to grab a medal, and upon completing a coloured series (for example, the white series), you will unlock the next series which is more difficult than the last. When coming into these tracks for the first time, even the easiest tier will give you some trouble in certain areas, so as you can imagine, the hardest tracks will potentially enrage you, but at the same time they test your skill and force you to improve. It's only you and the road in this mode, and it can get slightly boring after prolonged sessions. It's a shame that there wasn't a championship mode that pits you against other vehicles as this would have been more exciting and probably less infuriating than what we've been given. The other singleplayer option that's available is the trackbuilder and this is definitely one of Trackmania's highlights. Here, you are given free reign to create a track, from scratch, using any of the four available environments. It's your choice whether you'd like to use the beginner, normal, or advanced creator tool but once you get stuck in, you can't deny the entertainment value. 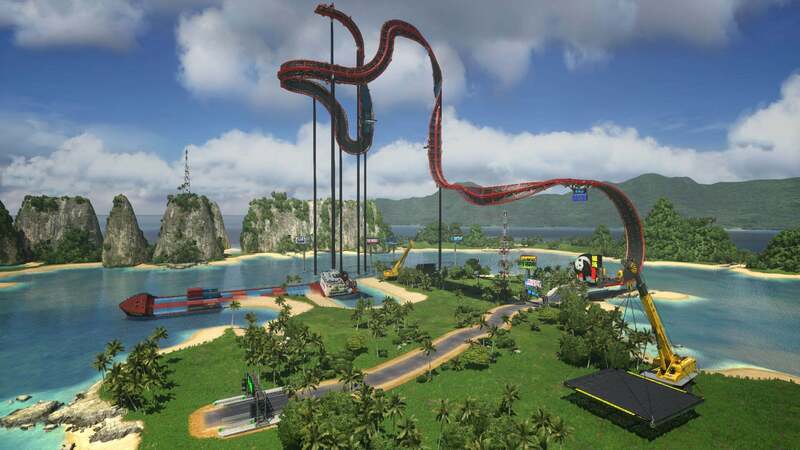 Twists, turns, huge vertical drops, turbo areas and more can be placed and the game remains in a birds-eye-view so you can see exactly how your track is looking at any given moment. At any point, you are also able to test out your track even when it's unfinished, and it's hugely enjoyable to create tracks purely to see how they play out. I personally spared no expense in creating multiple climbs and drops just to watch my car go flying off the end for the sheer thrill of it. Challenging friends with your creations is also an option, so on top of the high amount of already available tracks, this causes almost endless opportunity. If you're wanting to face off against some competition, you have a number of modes available to you. Local multiplayer with split screen is there if you want it, and there is even a very strange double driver mode, where both players are controlling the same car in an attempt to reach a happy medium. It's a rather peculiar concept, and adds a bit of diversity to the game, but if you want your car to even attempt to stay on the right path, stick to solo driving. Your tracks from the trackbuilder can be used to great effect here too, so it's nice that online multiplayer isn't the only viable choice of playing against other people. If you decide to plunge straight into the online mode instead, you will find various rooms to join. These rooms will show you the amount of players currently racing together, as well as the different environments and modes you will be competing in. Once you make your choice, you will be taken straight to the action even if it's in the middle of a race, however there tends to be a fair bit of loading when going from one track to the next. The game tends to regular opt with the time attack mode, where you'll constantly be doing laps of a track until time runs out, attempting to get the best lap time possible. Other players can be seen as you race, most likely doing what you're doing and flipping over the sides or accidentally flying off the edge until they figure out a strategy. You will sometimes be put in an actual race, though, but it always feels the same and there's no real difference in these modes. Amongst all of this there can be around forty players battling it out so it adds a bit more chaos to the otherwise lonely campaign mode. One major downside of the online mode is that while you can see other players as you race, their car is not a physical object that you have to be careful of. They are in fact transparent, ghosts if you will. There is an element of competition in there, and it eliminates the obvious chaos that would come with thirty players crashing into each other, but this actually causes you to feel isolated, just like the singleplayer modes. With the arcade take on the game, one may have thought powerups and goofy weapons would have made an appearance, but sadly not. If the modes were designed a little differently with these things in mind, great fun could have been had. It just feels like missed potential. The final mode (of sorts) that's available is the garage and customising. Here, you can change the colour and design of the given vehicles but there's not really that much to see. The game only has four different cars (one for each environment) and it's likely that you'll try the customisation options once and then just carry on racing as they feel a bit pointless and slightly tacked on rather than anything interesting. You can also play around with the background music of the game, and while there are some fun, bouncy tracks, they are mostly forgettable and seem to fade into the background while racing. 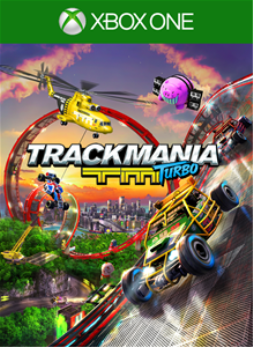 Trackmania has forty-eight achievements in total and they require you to experience nearly everything the game has to offer. Prepare to endure the campaign mode until your brain explodes as you will need to get a gold medal on every single track which obviously isn't the easiest challenge to overcome. You get an achievement for completing each section in each of the series' as well so points will come naturally as you play. Various challenges will also need to be completed, but overall, it's going to be a potentially long and tough completion if you want the full 1,000G. While playing Trackmania Turbo, the same two words kept cropping up — missed potential. The game does have some very creative tracks, and the trackcreator is a fun mode if you want to simply mess about and see what happens, but a lot of the game takes some unexciting turns. Regularly infuriating time trials are all that takes up the singleplayer racing mode, and the online is hindered by its design choices. The game isn't bad, but it would have been more enjoyable and less frustrating if it went down the route of Revolt or Micro Machines instead. The initial asking price is quite steep, which may be due to the fact that the game comes in retail format as well as digital, but fans of the genre will still have fun with it if they invest a decent amount of play-time. It may be frustrating at times, but if you like your racers, Trackmania Turbo may be an interesting distraction for you. The reviewer spent 7 hours racing across many tracks, as well as smashing and bashing his car too many times. 20 of the game's 48 achievements were earned along the way. A physical copy of the game was provided by the publisher for the purpose of this review.